When I awoke in the morning, I immediately thought of my mother. It was my 46th birthday on the Roman calendar, and I thought about how on this day each year I would send her flowers and call her on the telephone. A strange feeling came over me as I realized I couldn’t do these things today: my mother died a few months ago. Thoughts of her came to me throughout the morning as I remembered how she had gradually accepted Krsna consciousness through the years, and had been reading Srila Prabhupada’s books during the last months of her life. She had even ordered tapes from my tape ministry in England, and according to my brother had been listening to them every day before she passed away. I said a prayer to Lord Krsna, asking Him to see to her continued progress in Krsna consciousness. I remembered Srila Prabhupada’s words about his own father in his dedication in Krsna Book. He mentioned how his father had been kind to him. My mother expressed her kindness by sending me money and gifts throughout my years in the movement, thus assuring herself opportunities for more service in her next life. I thought about how she had received much mercy in her life and how the source of her good fortune was ultimately Srila Prabhupada, so I sat down in the afternoon and wrote my 1995 Vyasa-puja offering to Srila Prabhupada. It was based on the story of my mother’s departure under auspicious circumstances, only by his mercy. I faxed it to Dravida dasa, the editor of this year’s Vyasa-puja book. After the morning program I had a meeting with my disciple Adi Rasa dasi. When she came in I didn’t recognize her, partly because she wasn’t wearing a sari. When she introduced herself and her mother to me, I was about to chastise her for not wearing a sari in my presence, but I suddenly realized from her appearance that she was probably too poor to afford one, so I held my remarks and asked about her welfare. She smiled and said she was happy in devotional service. She thanked me for giving her the opportunity to see me. She explained that she had been coming each morning for the past few days to meet me, but because there were so many disciples and guests who also wanted to see me, she never reached the front of the line. The full impact of what she was saying hit me when she said she lived four and a half hours away in the countryside. So I spent some extra time with her and her mother. When her mother asked to become my aspiring disciple I consented. I asked what had impelled her to become a devotee. My translator, Sri Govinda dasa, explained to me that in the Russian Army if soldiers are disobedient, senior officers will sometimes kill them on the spot. Therefore, many young men try to avoid military service. I reflected once again on the tough life of the common people in this country. Later in the morning I noticed a young girl chanting in the temple. I had seen her at the program the previous night. She looked frail and sickly. When I asked who she was, the devotees told me she was Sati, my 12-year-old aspiring disciple. She would soon be going to a hospital in Moscow to have her left kidney removed. Later I spoke to her mother, who told me the local doctors could not be sure what Sati’s problem was, but felt that removing her kidney would help. I was shocked. She also explained that due to the war in Chechnya there was a shortage of medical supplies, and so in desperation she was going to take Sati to Moscow and request the help of any hospital. I told Sati’s mother I would try to assist in some way and that she shouldn’t let the Russian doctors handle the case any further. I called Poland and asked Amrtananda dasa, my main assistant there, to look into the possibilities of bringing Sati to Poland for medical aid. I also considered calling my disciples in South Africa to see if they could help bring Sati there for treatment. In the evening we went for a program in a Muslim village. I was curious to visit there because I had heard that the villagers worship a god they call Wastraji, who they say has appeared descending from the sky riding a horse with three legs. There have been many sightings. In fact all the villagers have seen Wastraji many times. The last time he is reported to have appeared was in 1990, when the villagers say they approached him with an offering of a dead goat and wine. He became angry with them and said he would not accept such bloody offerings. He told them that if they wanted to please him they should bring him vegetarian foods like milk and honey. We passed a twenty-foot statue of Wastraji as we drove into the village, where Sri Prahlada later lectured to three hundred people. While he spoke I was sitting at the back of the hall fiinishing my rounds. Suddenly a little girl about nine years old came and sat next to me. She stared at me for some time. 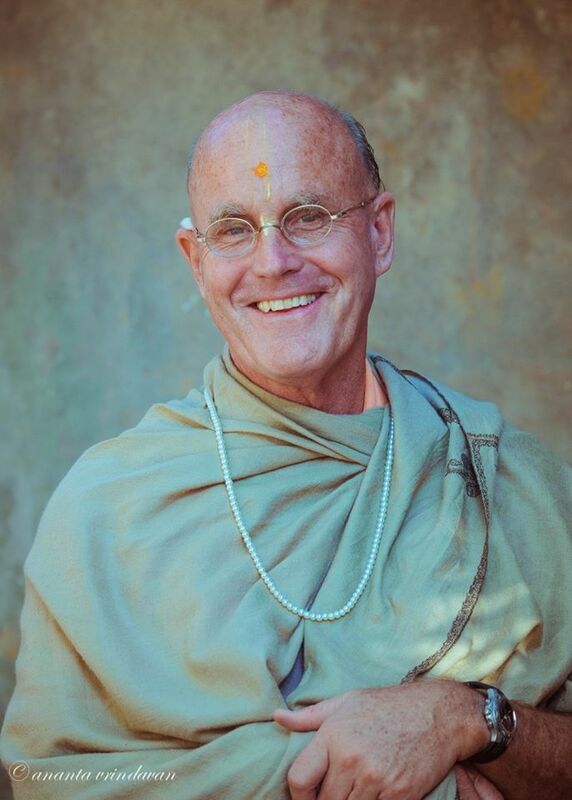 “Are you Indradyumna Swami?” shed asked. Through Sri Govinda I told her I was and continued to chant my japa. She stayed next to me for the entire lecture and afterwards followed me outside the hall. It turned out that her mother, who was from that village, had recently taken an interest in Krsna consciousness. How the little girl had heard of me, I don’t know, but as her mother was taking her home the little girl turned to me. “Can I travel with you?” she asked. Before we left the village I was speaking with some of the local Muslim men. They were dressed in typical Islamic clothes and sported big mustaches. I was preaching about a vegetarian diet and mentioned Wastraji’s request that they offer him only vegetarian foodstuffs. Trying to emphasize my point, I said that I didn’t think any of them would actually have the heart to kill an animal themselves in order to eat it. I said that I didn’t feel they could kill anything, man or animal. I was obviously naive about the time and place where I was speaking and to whom. I looked uncomfortably at the men around me, who an hour before had been blissfully chanting Hare Krsna but who now appeared like vicious animals.